As students in geometry class, we learned and dutifully memorized that the shortest distance between two points is a straight line. This axiom asked us to conceive of a logical world of pure form distanced from lived, tangible reality. Although ancient Greek mathematics has been expanded and countered with more recent variants, Euclid’s “breadthless length” — line and especially the straight line — signifies a rational order apart from emotion or an ideal distilled from specificity and corporality. Artist Barbara Rosenzweig embraces the abstract clarity and sparing elegance of straight lines, while simultaneously eliciting expressive force from their precision. She does not subvert so much as suspend our expectations. 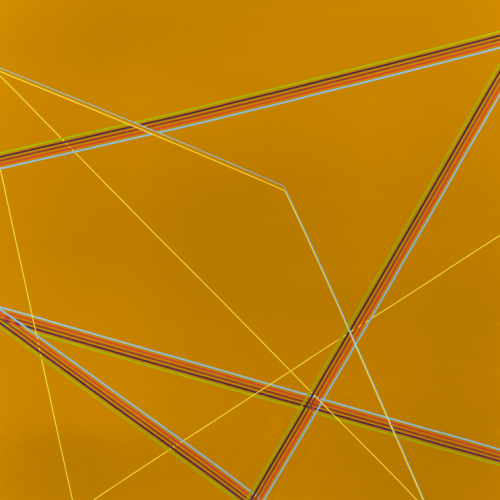 In her latest series of paintings, Rosenzweig sets individual lines or four or five straight lines parallel to each other within a color field. As the axiom states, these lines mark points apart from one another — from here to there — with points also implied outside the painting’s rectangle. In this way, she flips the axiom in that the straight lines must arrive at a point; so the cascade or upsweep of zig-zagging patterns build in intensity and tensile strength, as they extend higher or wider. Relishing the economy in traveling from point to point, she taps into the viewer’s ingrained understanding of making a beeline to a destination, and thus her linear pathways are just as visceral as cerebral. She incorporates a single journey within a larger wandering, playfully erratic itinerary with lines appearing to fold back on themselves. Rosenzweig orchestrates those elements that transform a stationary, hard-edged design into a dynamic configuration of potentially infinite expansion. With angles reading as arrows, Rosenzweig’s lines have an almost vector-like direction, snappily traversing and rebounding at an energetic pace. Whether the lines are conduits or are themselves in motion is ambiguous as is the scale or dimension of the space they occupy or create. The span between any two points can be miniscule or immeasurable. Her lines have an affinity with the graphic experimentation of Constructivist Alexander Rodchenko, who described line as both frame and trajectory: “it is movement, collision, attachment, slicing apart, and joining.” While his cause was revolutionary, Rosenzweig engenders a feeling of freedom from restraint, a place where boundaries are negotiable. Renaissance architects, painters, and sculptors introduced single-point perspective to represent space according to humanist principles. Geometry was used to plot lines that converged at a vanishing point based on the position of an imaginary viewer’s eye. While the receding space is more realistic, the illusion results from measured regularity and requires the composition to include straight lines. In Florentine art, line would come to reign supreme as disegno, Aligning themselves with Neoplatonism, artists determined that line was best suited to portray ideal form, for outlines as such do not exist in nature. Rivalry emerged between Florentine disegno and Venetian colore, in which tonality was used to convey the naturalistic effects of light. For champions of line, color was secondary in that it was temporal and even capricious. Recast as Poussinistes v.s. Rubenistes, this contest became even more firmly set with the rise of the academies, profoundly influencing art and criticism well into the nineteenth-century. One might say that the threshold of modernism was characterized by artists seeking to resolve or make moot the distinction and hierarchy of line and color, and yet the opposition still reverberates in art making today. 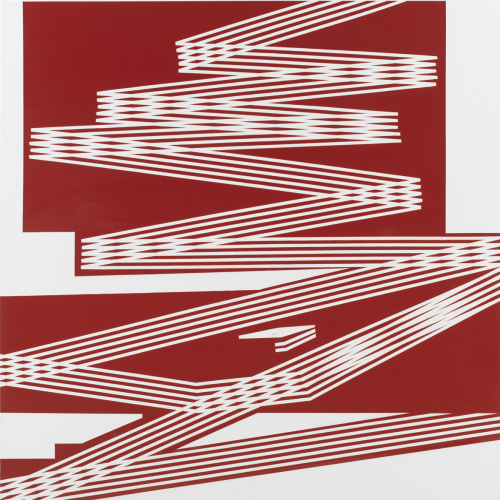 Situating her lines-qua-lines within richly colored fields or assigning them bold hues, Rosenzweig sets her task to “equalize the weight of line and color.” Revisiting tradition in Minimalist guise, she intensifies the defining qualities of each to create tension and intrigue. In earlier work, the artist’s emphasis was on pigment with straight lines produced by one color area abutting another. Enamored of the physical properties of paint, Rosenzweig prefers oils as her medium, because they are sumptuous and more luminous, and she responds in her process to their sensuous qualities — the way they smell, the way they feel as she pulls her brush across the surface. She proceeded to demarcate the zones of color with sharper edges, heightening contrast with off/on punctuation and complementary colors. Outlines of geometric shapes commingle with straight-edge lines in a way that suggests design schematics, and yet the ambiguity of foreground and background defies any simple reading of volume or perspective. Following apace, Rosenzweig granted lines more autonomy and prominence. Seeking colors for their excitement, she let the gessobord or canvas of a single hue serve as a field of operations for colored lines or lines of color that suggest beams of light ricocheting, intersecting, and overlapping but that also suggest taut lines of a stained cord made by Quattrocento painters to block out a fresco — only not subject to symmetry or serving figurative needs. Through this progression, she came to make the relationship between surface and depth tantalizingly problematic. When the American artist acquired a home in Italy in the early 90s, Rosenzweig was able to indulge in her love of frescoes and traditional materials, learning to grind her own paints like Renaissance masters. No longer employing this practice, she still achieves resplendent color by building it from layers of paint. While suggesting positioning or movement in depth, her configurations of lines may also be read as flat strokes of concentrated color. Rosenzweig works her lines in an energetic manner that approaches the gestural, which is a stunning visual incongruity. 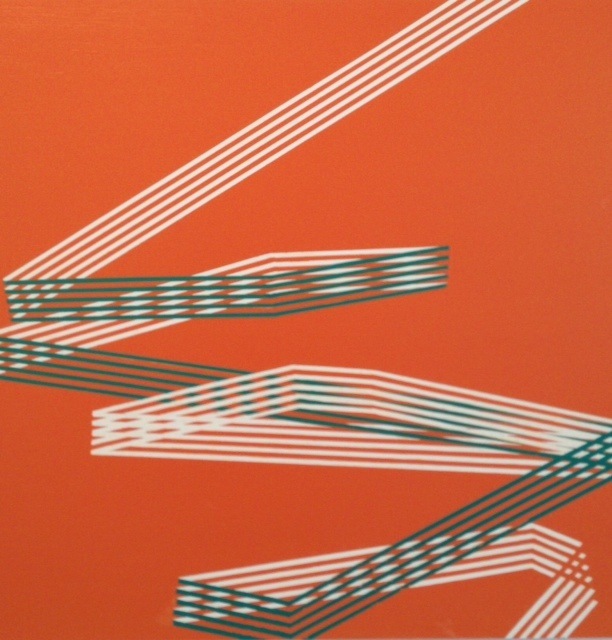 The active linear pattern with convoluted overlaps pulls away from the surface, but its depth is distinct from the depth residing in the application of paint. Countering optical with tactile, varying lengths arranged in interweaving diagonals and crisply-cut angles provoke the viewer’s agitated eye movements, while the subtle density of paint imbued into linen arouses a physical response of surrender. 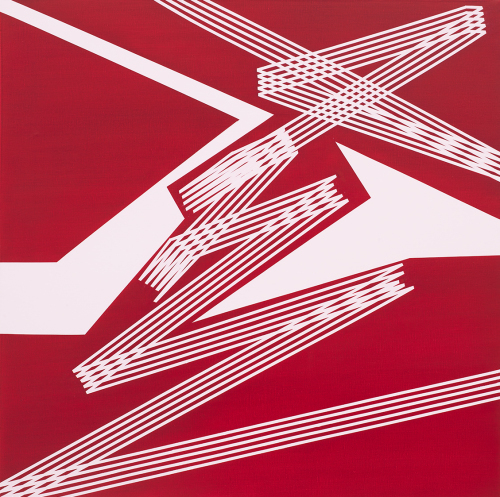 Offering insight into her process, Rosenzweig states, “Despite the careful and precise mathematical appearance of my work it remains intuitive. I am always ready for the unexpected and whatever changes might be required along the way.” For her palette, she chooses colors and their combinations not for their associations but for the fascinating dialog they can have, creating complexity and nuance with even a limited selection. Color fields are broken up into geometric shapes that are both consonant with and conflict with the lines. Using white as color and caesura, Rosenzweig combines it with a magnificent heraldic red, while slim silver lines embroider those of white. Red rectangles may contain or be a backdrop for linear patterns that are suddenly truncated or continue on to enjoin with lines beyond, and the bedazzling quality of white juxtaposed with red makes any fixed reading a chimeric enterprise. Disrupting retinal focus, criss-crossed parallel lines turn into dazzling, vibrating optical effect: the logical world of pure form dissolves into delightful aesthetic play. Of his recent exhibition Eccentrico, Giorgio Armani states, “simplicity of line does not equal simplicity of thought,”making a case for the importance of imagination in his minimalist design. With masterful attention to detail, Rosenzweig upholds the beauty that can be found — that artists have found — in “the shortest distance between two points is a straight line.” Yet in her reductive but elaborate paintings, she shows us that reason can only take us so far.